Welcome to Sea Dunes in Fort Walton Beach, Florida! 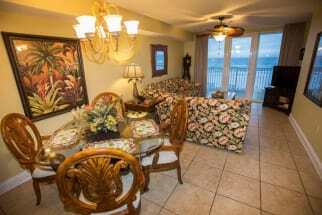 This mid-rise condo complex sits beach front to the emerald green waters of the Gulf Coast. The easy beach access, the community pool and hot tub with ocean views and the grill out areas have kept guests coming back to Sea Dunes for years. Each Condo offers a spacious balcony with breathtaking views of the Emerald waters. Fort Walton Beach has been a vacation dream for countess guests due to its beautiful white sandy beaches and its endless activities. Spend your days relaxing on the beach or take a trip out to sea with one of the many local fishing charters. Rent paddle boards to explore the marine life or get adventurous and parasail above the coast. The small city offers plenty of dining opportunities such the Old Bay Steamer, Fokker’s Pub, and Ali’s Bistro. Sea Dunes is a great destination for your next get-a-way. Offering a great environment and countless amenities, you will love your stay at Sea Dunes. Be sure to plan your next trip to Sea Dunes with ECBYO. Booking direct with the property owners on ECBYO will assure you the best price for your vacation rental. Be sure to click the email owner button found on each lisitng to send an owner a message directly. They will get back to you shortly and glady answer any questions you may have and assist you in booking your next Sea Dunes vacation! Book online today with emeraldcoastbyowner.com and save!